Colds and flu are viral illnesses that infect your upper respiratory tract, causing symptoms such as chest congestion, runny nose, watery eyes and cough. Influenza, more commonly known as the flu, can also cause fever, nausea and vomiting. Although there is no cure for either of these illnesses, certain herbal teas may help relieve the symptoms of these illnesses. Check with your physician before using any herbal tea to treat cold or flu symptoms. Ginger tea is a spicy, aromatic tea made from fresh or dried ginger root. Ginger may help relieve chest and nasal congestion associated with cold and flu, according to Michael Castleman, author of "The New Healing Herbs." The chemical compounds in ginger may also help your body fight off viral cells, speeding your recovery from influenza and colds. Talk to your doctor before using ginger tea to treat colds or flu; it may occasionally cause heartburn. The leaves of the eucalyptus plant, an herb native to Australia, may help relieve cold and flu symptoms. Aboriginal tribes used teas made from eucalyptus leaves to treat fever. Eucalyptus also contains a chemical compound, called eucalyptol, that may help loosen phlegm and relieve chest congestion, according to Castleman. This chemical may also help destroy the influenza virus. 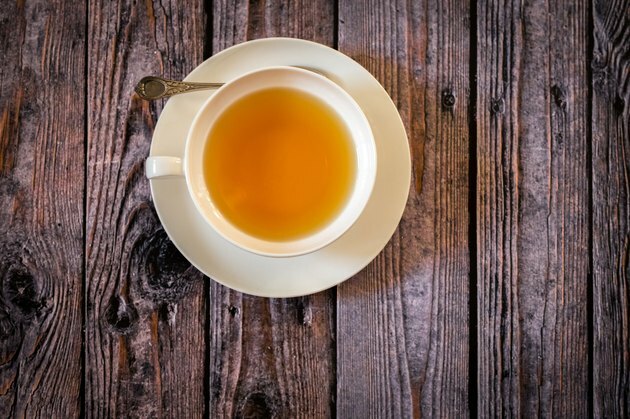 Consult your physician before drinking eucalyptus tea -- in rare cases, it may cause skin rashes. Peppermint is a common ingredient in over the counter cough remedies and decongestants. This herb contains a chemical called menthol, which may help relieve congestion and encourage productive coughs. The oil in peppermint leaves may also have antiviral benefits, helping to prevent the spread of viruses that cause colds and flu, according to Phyllis Balch, author of "Prescription for Nutritional Healing." Talk to your doctor if you plan to use peppermint tea for colds or flu. Although peppermint tea is safe in normal doses, but high consumption of menthol -- as little as 1 tbsp. -- can be toxic. Mate is an herb that was used by native Indians of South America as a preventative for scurvy, according to Castleman. They also recommended tea made from this herb as an appetite suppressant. Mate tea contains vitamin C, which may enhance immune system function, helping your body ward off cold and influenza viruses. Check with your physician before drinking mate tea for cold or flu prevention -- this herb contains caffeine, which may interfere with restful sleep.